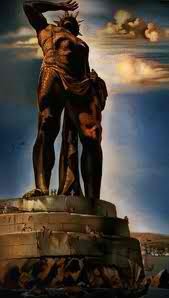 In 304 BC, the people of Rhodes (a Greek island in the eastern Aegean Sea) built the Colossus of Rhodes to celebrate their victory in 305 BC over Demetrios Poliorketes, the son of one of Alexander the Great’s successors. The Rhodians took the money from the sale of Demetrius’ siege equipment and commissioned Chares, a native of Rhodes and a student of the famous sculptor Lysippus, to construct a bronze statue to honor Helios, a pagan Greek Titan and patron of the city. 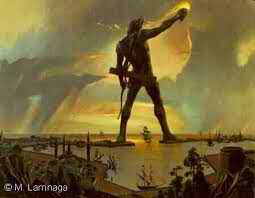 The 110 foot tall statue which rested on a 50 foot high marble pedestal at the entrance to the harbor, took 12 years. Chares incorporated Demetrios’ bronze weapons into the statue. The workers cast the outer bronze skin parts which was fortified with an iron and stone framework. Ancient accounts has the Colossus straddling the harbor but later accounts assert that it stood on a pedestal to one side of the harbor. The statue snapped at the knees, fell during an earthquake circa 226 BC and lay on the ground for 800 years. Pliny reported the statue was so large that several people could wrap their arms around the statue’s thumb and each finger was larger than a full-size statue. Although it only stood for 56 years, the oracle of Delphi told the people of Rhodes not to rebuild it. In 654, the story is that an Arab Muslims captured Rhodes, broke down the statue and sold the bronze to a merchant in Edessa.